I have been an amateur boat mechanic for many years now. Being a boat mechanic is not the most glorious job in the world. One job that I frequently do on a regular basis is repairing boat steering cables. This is not an easy job, but not a difficult one either. Once your do it, it becomes easier the next time you do it. It is like riding a bicycle once you have the knowledge. I want to share with you the knowledge of how to do this based on my experience and hopefully this can save you some time and money when purchasing and installing your repair kit for your hydraulic boat steering cable. How to measure boat steering cable can be a challenge for someone doing this for the first time. Step 1 is to identify if you have a rack or rotary boat steering cable. A Rotary cable has a spiral wrapped and black core wire that usually sticks out at the helm end of the steering cable. On the other hand, a Rack and pinion boat steering cable has a somewhat longish, metallic housing and also features a flat gear, also known as a rack gear, inside (usually located somewhere under the boat’s dash). Once you have identified if it is rotary or rack steering, then it is simply a matter of measuring the boat steering cable. If your cable is a rotary steering cable, measure the plastic cable jacket in inches, add 18”, and round up to the next foot. If your cable is a rack steering cable, measure the plastic cable jacket in inches, add 30”, and round up to the next foot. Then you must order that length of cable as per your measurement. 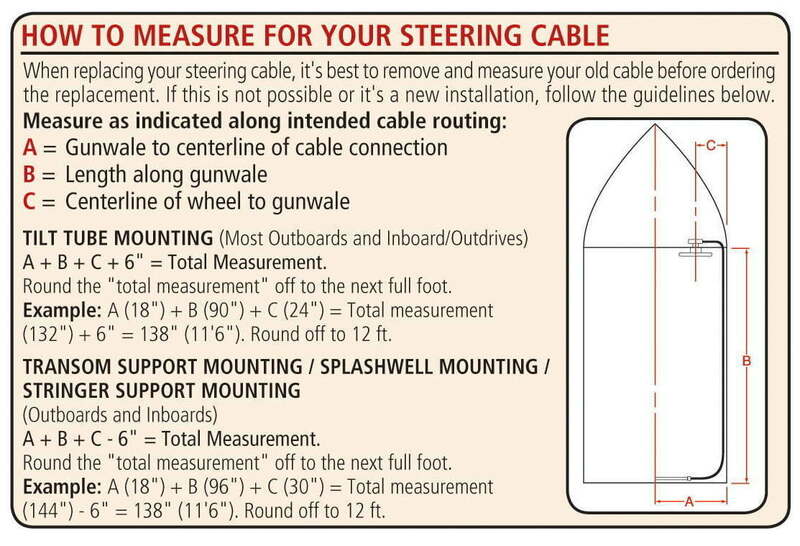 That’s basically all there is to measure boat steering cable. I could go through a step by step instruction describing to you how to remove boat steering cable, however most boat steering cable kits come with a repair & installation guide. The general rule here is to be careful. Follow the instructions carefully, either via watching a YouTube video, or following your repair booklet. The trick is to carefully remove boat steering cable and remembering what you did while removing it. If you are getting a little older like I am, I have do things slowly and deliberately to keep them fresh in my mind. If necessary, take notes as you remove boat steering cable, so in a few years when you need to do this again, you won’t have to remember how to do it. The rule here, once again, is to follow the instructions carefully, and make sure all connections are done per the manufacturer’s specifications. You can also follow the great guide that I found over at BCSalmonFishingCharter.com. Do not over-tighten connections when you replace boat steering cable, and reinstall in exactly the reverse way that you took the cable out. Also, it is important to test everything once installed to check functionality is perfectly operational before taking your boat out onto the water and discovering that the repair kit you completed is not to your liking. If you test first, then you should be able to correct any issues beforehand. Finally, I highly recommend that you develop a habit of checking the steering and your boat steering cable at least once a year as part of your regular maintenance. This will ensure that you intercept any potential future issues before they occur and will save you time and cost of having to replace boat steering cable again in the future. It will also keep your boat in tip-top condition as well.